The conversion of the Apostle Paul is one of my favorite stories in the Bible. After his salvation, Paul preached the good news about Jesus in Damascus, the city where he had intended to persecute the followers of Jesus. Paul’s preaching angered his former Jewish supporters who hatched a plot to kill the new evangelist. We don’t know how, but Paul found out that his life was at risk. Those seeking his life enlisted the help of the governor, who kept guards at the city gates in hope of catching him (2 Cor. 11:32-33). Paul was trapped in the city of Damascus with no way out — until his disciples came up with a clever plan to help him escape. Paul’s friends put him in a basket at night, secured the basket with ropes, and then lowered him to safety through a window. As a result, Paul was able to escape and continue his work of spreading the gospel throughout Asia Minor and beyond. He escaped because there were people willing to hold the ropes for him. We don’t have much information about the guys who helped Paul but we do know this. These unnamed individuals recognized the need to cooperate because the task could not be completed by one person. They also coordinated their efforts because working in harmony was the only way to get the job done. And, they combined their strength to hold the ropes because the task could not be done with the strength of only one person. Teamwork is a beautiful thing. 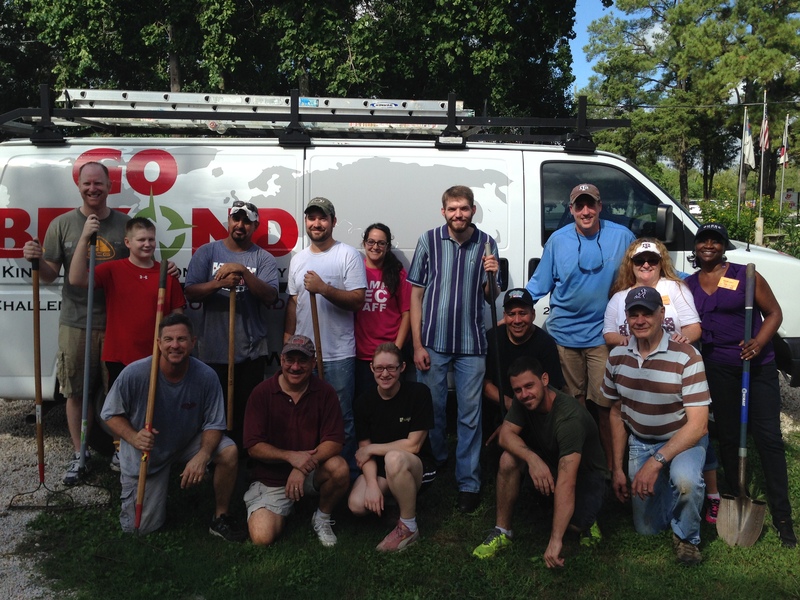 Helen Keller said,”Alone we can do so little, together we can do so much.” She was right. Together is better. This morning, members of Kingsland’s Ten-24 Adult Bible Fellowship and a few of Gil Harris’ Band of Brothers met at Manna House in Brookshire. Manna House is a residential program for men recovering from alcohol and drug addictions and one of our missions ministry’s local partners. Manna House relies on the support and kindness of others to keep its doors open. They do a remarkable job of helping men to discover the life-transforming power of the gospel of Jesus Christ. This morning part of our team installed flooring in the Manna House thrift shop and the rest of our group spread and compacted five yards of decomposed granite to create a new patio outside their chapel. The work today was made easier because we worked in harmony toward a common goal. 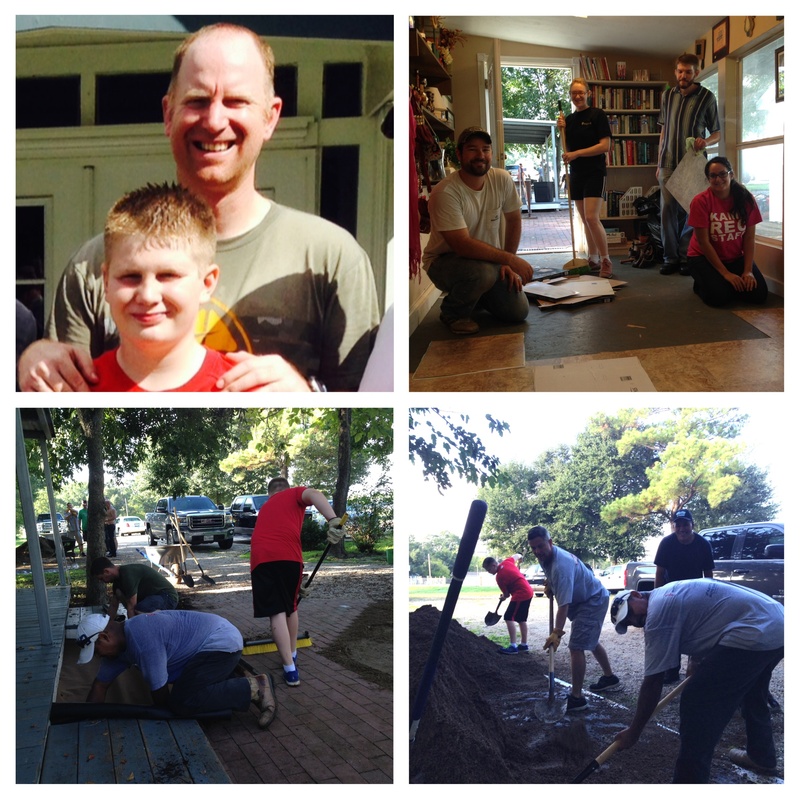 I was especially glad that my friend Neil Lovelady brought along his young son Owen to help. Twelve year-old Owen worked like a Trojan. One of the best things about our Saturday local service initiatives is seeing parents and kids work shoulder-to-shoulder — making memories of serving together. We got the job done this morning because, from the oldest to the youngest, we worked as team. And, working together is a very good thing! Omar, this story seemed to really touch my heart today. I am happy to see how God is continuing to use you in His work. Seeing your dedication for so very many years makes me elated. God is good, all the time & all the time, God so good. Great to hear from you, Janet. Thanks for your encouraging words.